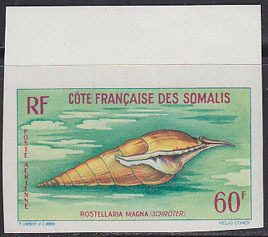 77128 ND SOMALI COAST (1962) Rostellaria magna*. imperforate. Scott No C28, Yvert No PA31. 77129 ND SOMALI COAST (1962) Lambis bryonia*. Imperforate. Scott No C29, Yvert No PA32. 59005 EL MADAGASCAR (1973) Volva volva*. Deluxe sheet. Scott No 481, Yvert No 516. 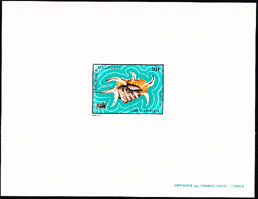 59006 EL MADAGASCAR (1973) Lambis chiragra*. Deluxe sheet. Scott No 482, Yvert No 517. 59007 EL MADAGASCAR (1973) Harpa major*. Deluxe sheet. Scott No 483, Yvert No 518. 59008 EL MADAGASCAR (1973) Volva volva*. Deluxe sheet. Scott No 484, Yvert No 519. 59009 EL MADAGASCAR (1973) Lambis chiragra*. Deluxe sheet. Scott No 485, Yvert No 520. 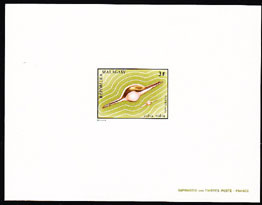 42863 ESS AFARS & ISSAS (1975) Conus sumatrensis*. Nautilus*. Horseshoe crabs*. Jellyfish*. Trial color proof pair. Scott No 384, Yvert No 401. 42859 ESS AFARS & ISSAS (1975) Ranella spinosa*. Crabs*. Starfish*. Trial color proof pair. Scott No 388, Yvert No 394. 77161 ESS AFARS & ISSAS (1975) Ranella spinosa*. Crabs*. Starfish*. Trial color proof. Scott No 388, Yvert No 394. 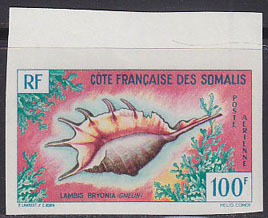 62840 ND DJIBOUTI (1978) Seashells*. Set of 2 corner imperforates. Scott Nos 480-1, Yvert Nos 486-7. 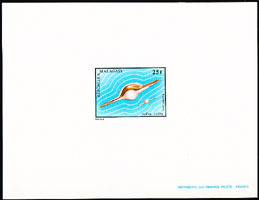 44127 ND DJIBOUTI (1980) Shells*. Set of 2 imperforates. Scott Nos 515-6, Yvert Nos 521-2. 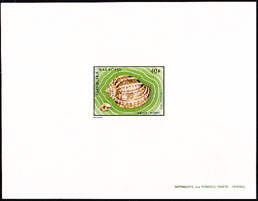 60984 OBL HUNGARY (1983) Snail*. 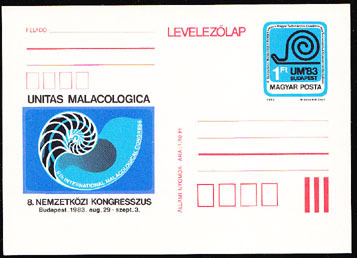 Postal card with stamp and cachet for International Malacological (Molluscs) Congress. 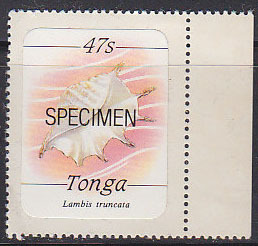 78032 SPE TONGA (1984) Lambis truncata*. Specimen. Scott No 575, Yvert No 564. 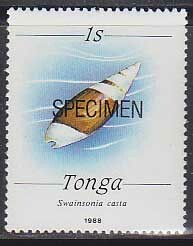 77157 SPE TONGA (1988) Swainsonia casta*. Specimen. Scott No 682, Yvert No 697. 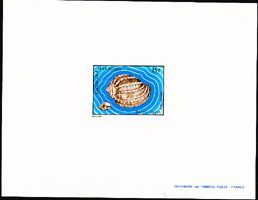 77156 SPE TONGA (1988) Cypraea mappa viridus*. Specimen. Scott No 684, Yvert No 699. 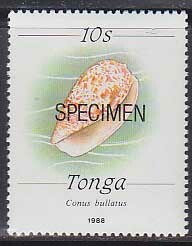 77158 SPE TONGA (1988) Conus bullatus*. Specimen. Scott No 686, Yvert No 701. 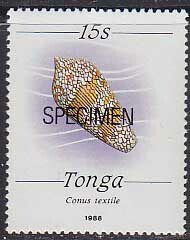 77155 SPE TONGA (1988) Conus textile*. Specimen. Scott No 687, Yvert No 702. 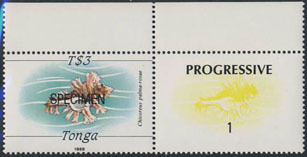 77159 SPE TONGA (1988) Chicoreus palma-rosae*. Specimen. Scott No 692, Yvert No 707. 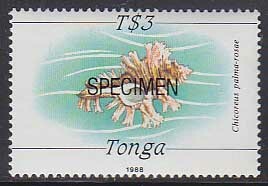 58143 SPE TONGA (1988) Chicoreus palma-rosae*. 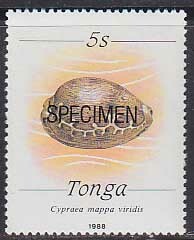 Specimen with progressive proof. Scott No 692, Yvert No 707.